This week I am trying a little something outside our normal spectrum of products. At Style4men.ca we like to focus on hair pomade and wet shaving, but that doesn’t mean that these are the only area of concern in our grooming regimen. Oral hygiene is serious business. That said, toothpaste in particular is something we take for granted and also something where we might feel like there are no real alternative. Toothpaste is toothpaste! We could even argue that there isn’t much happening in this specific grooming area, but some brands are making serious head way. A little while back while doing my usual digging I came across a very interesting brand: My Magic Mud. Up front the name made me smile and spiked my curiosity. These guys are in the business of making oral care / hygiene products out of charcoal or activated charcoal. I’ll give you moment to get over the surprise. Yeah! The whole thing is a little unexpected to say that least, but this doesn’t mean that there is no credibility to the idea. As you may or may not have noticed, charcoal or activated charcoal is the new “IN” thing in personal grooming. You will find body washes, face scrubs, face washes and even shampoos made with charcoal. The premise is that charcoal has some surprisingly efficient cleaning properties. Obviously, charcoal powder being slightly abrasive makes it a perfect base for any sort of exfoliation, but where it gets even more interesting is when the charcoal is activated or magnetized. This increases the charcoal’s natural dirt collecting or attracting properties. In the case of a face wash, it will slightly exfoliate the skin and more or less act as a sponge with dirt. To date I have tried a number of charcoal based face wash which I have found to be quite efficient (L’Oréal, Dans un Jardin). In the body wash segment, my son’s Go-To body wash is the charcoal option from DOVE. I have had excellent results with charcoal products so far, so naturally I was interested in exploring the charcoal oral care options. Shout out (and a big thank you) goes out to Carley at My Magic Mud for making this review possible. Apparently, charcoal toothpaste is not an entirely new thing as some of the ladies in my entourage had already tried a few variations. To me, it was a new thing. Nevertheless, here we are and I am trying out a black charcoal toothpaste. 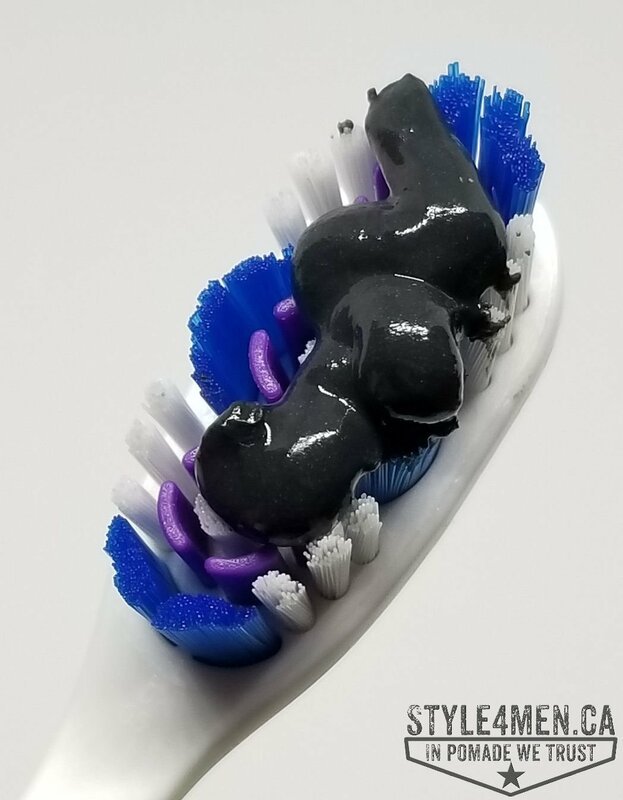 Yes, this toothpaste is black. If there is any part of you with Goth envy, you will like this. My understanding is that you are to use this just as you normally would so I pumped a little portion on my toothbrush and ran it under the the tap. On contact I was pleased to discover a rather fresh and pleasant peppermint taste. This is not a new taste, but it was different from Crest, Colgate or even Mavis. Toothpaste is typically abrasive in the mildest of manners. This toothpaste is ever so slightly more abrasive than crest for example. What that means is that I got an excellent cleaning. My teeth felt smooth and very clean. I will also venture that I noticed an improvement on my teeth’s colour right away. The whitening property of charcoal toothpaste is one of the main selling features. Being a dedicated coffee drinker, my teeth can benefit from a good whitening. After brushing comes the rinse. I found the rinsing to require perhaps 2 good gargle-rinses. I suspect that this is due to the fact that the toothpaste is black and therefore visible Something we probably wouldn’t notice with white toothpaste. As part of my first tests using My Magic Mud, here are some of the other things I noticed. My breath felt better and my overall mouth felt fresher. Just for that alone, this toothpaste impressed! Having sensitive teeth, I have been using Sensodyne for a number of years. Sensodyne is an extremely smooth and gentle toothpaste which also has a bit of coating element to protect sensitive teeth. Obviously, brushing with My Magic Mud I noticed a difference as there is no coating to de-sensitize the teeth. I was also using an electric toothbrush, which I found to be too aggressive of an approach for this product. I picked up a regular tooth brush and have been enjoying My Magic Mud since. I will say that as much as I enjoy this product and its benefits, it might not be an everyday product for my mouth. The sensitive teeth thing is suggesting that it is an every other day usage for this guy. 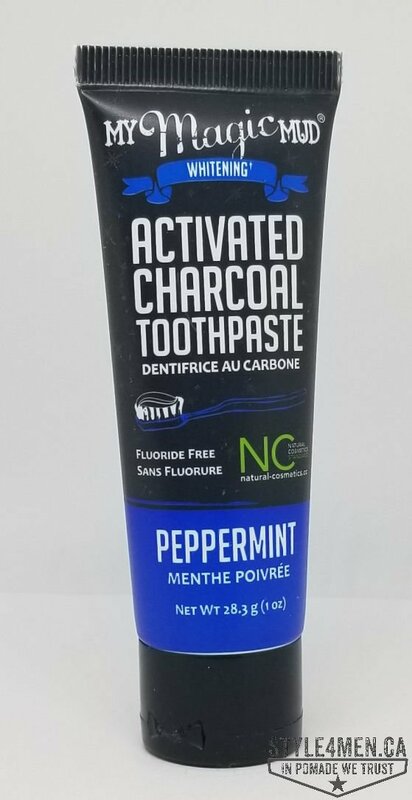 In closing, I was thoroughly impressed by this charcoal toothpaste: great cleaning power, noticeable whitening, improved breath and mouth comfort. If I were in product development, I would make the case for a sensitive teeth version of this charcoal toothpaste in hopes of using it all the time. Stay tuned for more reviews covering My Magic Mud as I still have the “Whitening Tooth Powder” to try.